As we approach the end of the calendar year, all of us at SOAR wish to thank our supporters! You help us in immeasurable ways – sharing our website and Facebook posts with others, reading and asking questions about this patient or that education ambassador, you donate money and you send needed supplies so we can achieve our three-fold goal of rehabilitation, education, and research. During 2017 you helped us replace our blood lead analyzer, filled our freezers with quality food, celebrated someone’s third Hatchaversary, and so much more. On top of that, you celebrate our releases with us and shed tears of sadness when a patient does not thrive. As the year winds down, we also want to let you know how you can help us finish out 2017 and start 2018 on a high note! 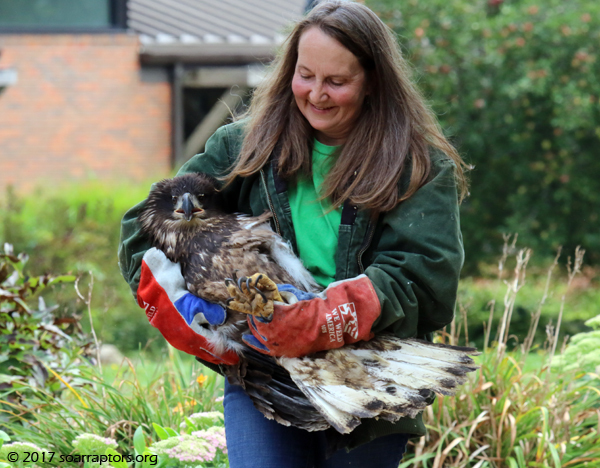 A HY16 bald eagle admitted from Runnells, IA in late May 2017 was released at the 2017 Release Party at the Iowa Arboretum. Just around the corner is the kick-off to our year-end fundraising efforts – #GivingTuesday! Mark November 28 on your calendar as a special day to support SOAR. For #GivingTuesday 2017. We have a year-end fundraising goal of $7,000 and that starts with #GivingTuesday! We are so fortunate to have an anonymous donor this year that will match all #GivingTuesday donations! For your donation to be matched, please donate via PayPal on November 28 or mail your check, postmarked November 27 to December 3! Details about the many ways to support SOAR can be found here. Put quality raptor food in the freezer. The cool part is that we already have just over $20,000 in grants, material donations, and labor to help with these projects. 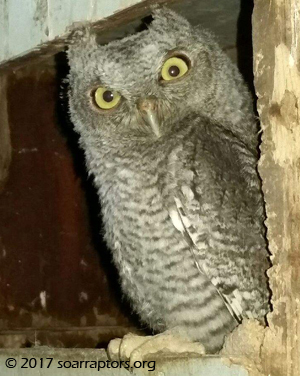 A hatch-year 2017 screech owl. Remember what Kay says, “Every one matters.” Every raptor and migratory bird that can be helped… matters. Every admit that we are able to release… matters. Every person that attends a SOAR program… matters. p.s. tune into the SOAR Facebook page at 5:30 p.m. CT for a live video of Kay and Ambassador Borealis to talk about the increased sightings of snowy owls this fall.